← Is Your Black Cat Rusty Red? This is a page on the American Curl that is written for children and anyone who likes plain English and nice pictures. This a well known cat breed from America. A cat breed is a type of cat that has its own look (appearance) and history. Read what a cat breed is by clicking here. A group of expert cat breeders have to agree before a type of cat can be called a “cat breed”. 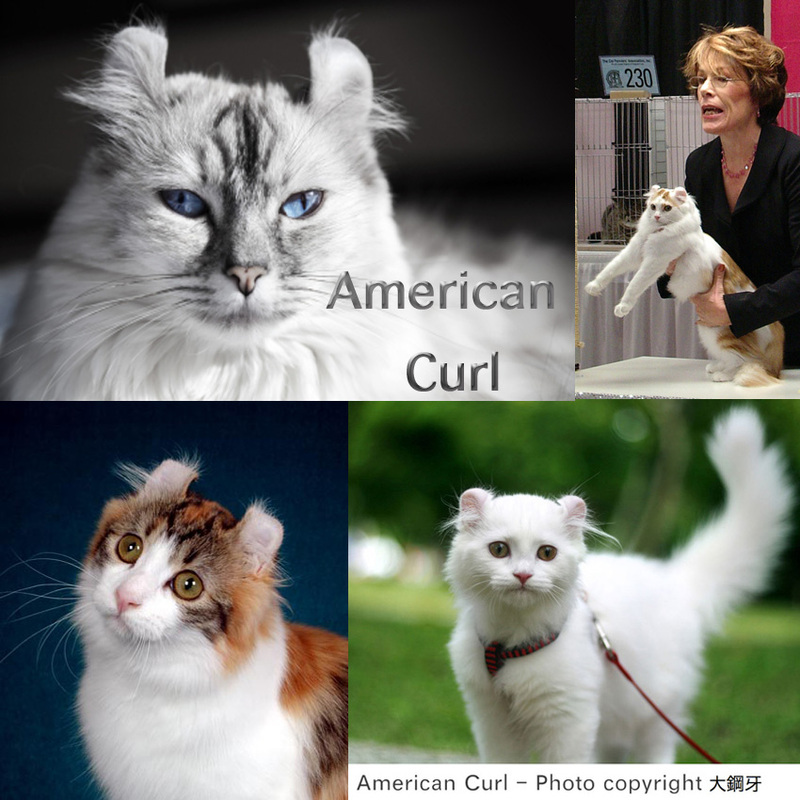 American Curls are nice regular looking cats of normal size and looks except for the ears, which are very unusual. They curl backwards. The reason why they curl backwards is because of a “genetic mutation”. What does that mean? Genes are very small things inside the body of animals including cats and they control how a cat looks. If something goes wrong when they are copied the new gene is different. This is what happened with the American Curl. The gene changed the stuff, called “cartilage”, that the outside of the ears are made of. The change made the ears curl backwards during the first 16 weeks of a kitten’s life. When the kitten is born the ears are straight. The ears are very important to breeders of this cat. The ears should be handled carefully. The amount of curl is important. If the ears don’t curl back enough the cat cannot be an American Curl. Instead, he will become a moggie house cat. The cats with ears that curl the most become show cats. They go to cat shows to win prizes. You can see such a cat in the picture below, on the right, with the lady. American Curl cat facts for kids. Credits: top right by semarr, bottom left coyright Helmi Flick, bottom right as stated and top left bought from iStockphoto. The first cat to be found with funny ears that curled backwards was a moggie living in California who wandered up the path to the front door of a couple of Californians in 1981. They were Joe and Grace Ruga. The cat was a female with a long haired, black coat and they called her Shulamith. The Rugas liked her and made sure she became pregnant. She gave birth to four kittens in December 1981. Two of them had curly ears. This was the start of making the cat a breed. Although, it was not until about 6 years later that the cat became a cat breed. What are American Curls like? Well, they are meant to be smart and they like the company of people. They are fairly quiet but will tell you when they want something. This cat has a nice easy going character. There are long and short haired American Curls. The long haired cats don’t have hair that is that long (not like the Persian which has very long fur). You will see this cat in many different coat colors and patterns. In the picture above the cats at the bottom is a calico (tortoiseshell and white) and the one on the right is pure white. The cat top right, at the cat show, is a two colored cat – white and light brown in patches. This cat is called a “bicolor”. This entry was posted in American Curl, Cat Anatomy, Cat Breeding, Cat Breeds, Cat Facts, Cat Facts For Kids, Cat History, Cat photography, cat shows, ears, Pictures of Cats and tagged American Curl Cat, cat breeds, cat facts, cat facts for kids, pictures of cat breeds by Michael Broad. Bookmark the permalink. Hi, what do you mean by “eye type”? They are very exotic looking. I wonder if this has any effects on the health and well being of the cats. I assume they hear normally – perhaps not as well, and I would imagine things could get in there more easily but I don’t really know.